EVERY YEAR, I MAKE IT A POINT TO CLEAN OUT MY JUNK DRAWER—the one miscellaneous things work their way into to sit for an entire year like junk mail, dead batteries, dried-out pens, hair ties, grocery lists and coupons. Every home has one, and I like to start off each year with plunging into that black hole to throw away what’s not needed and arrange the rest. It’s crazy how just that little bit of organization can make it easier to breathe when I look for a pen or pad of paper. 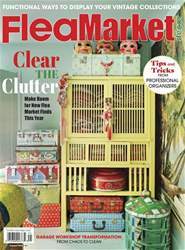 That’s why this issue is filled with storage, display and purging ideas to bring you some guidance with a collector’s version of spring cleaning!